Kimbanda is the fruition of multiple sorcerous impulses that were running through time in Brazil. In spite of much disagreement of the origin of kimbanda we can at least say that it was given a particular place with the formation of Umbanda in the 1920s. This was quite natural as Umbanda started as a syncretistic attempt focusing on uniting Kardecism or Spiritsm, Christianity, native folk magic and Afro-cults. Umbanda was founded as a consequence of the spiritst Zelio channeling of a message of unification from his caboclo (Indian). In this work of unification there were also made room for diabolic spirits and practices referred to as black magic or macumba in those days. The kingdom at the left hand of God, kimbanda was established and understood on Kardecist principles where the elevation by the power of light and charity was essential. In this fashion kimbanda became a cluster of helpful albeit perverse spirits that were seen as depending of the umbandista for engaging into a form of elevation towards light. This partly explains the hierarchy found in kimbanda where the spirits are separated into kingdoms and liens of origin. There is yet another organization quite similar to the hierarchy or armies and aristocracies, which suggest an influence from European grimoires. This influence is quite evident in the popular grimoire of São Cypriano, which is basically a collection of available magical practices, quite chaotic in its content and without the philosophical foundation found in most of the western grimoires. Rather, the grimoire of São Cypriano attempts to describe the varieties of magical arts ascribed to São Cypriano, a Bishop of Carthage from the 2nd Century as well as a host of other material. In the 1950’s Fontenelle and Alves contributed to a syncretism between kimbanda and ‘Grimorium Verum’. Most likely these ideas were in circulation long time before, but saw the light of print under the authorship of these two pioneers. Amongst the spirits from ‘Grimorium Verum’ that lend themselves to kimbanda are the three demon princes from Verum, Lucifer, Ashtaroth and Beelzebuth. The latter is known as Exu Mor in the hierarchies of kimbanda. Exu Mor has presented quite a puzzle and a multitude of contradictory explanations are to be found, but the simple truth of his becoming will also help us to understand more the progeny of the ‘demonic’ influences in the hierarchies of kimbanda. His mythical origin is traceable back to the destruction of Solomon’s temple, that were constructed on the mountain Mor or Moriah. In the seal of Beelzebuth we find even the insignia of the pillars of Solomon’s temple, a J and B. 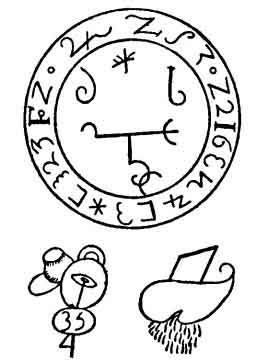 It is an adaption of this seal that is often used as his ponto riscado in kimbanda. These letters are both Jak-in and Bo-az as well as yud and beith. Jak means ‘he will establish’ and bo “confusion’. From the destruction of the temple the confusion is established and man is given an opportunity for deliverance, but he is also hurled towards the terrestrial where demonic intellects that attempts to pervert mankind is found. As such Exu Mor, symbolizes the house (beith) of confusion (bo). And interestingly from an unexpected quarter, Martines de Pasqually says about this that: “The number of confusion of the second column is designated by the binary rank held by the first letter of the word Boaz”. Ultimately the pillar of confusion carried the secrets of Cain’s legacy as the pillar of Jakin veiled the secrets of the descendants of Seth. So ultimately the mystery of Exu Mor is contained in yet another observation of Pasqually: “confusion derives from two powers in opposition, to sustain on the one hand, and to liberate on the other”. In this we can also remind of how Al-Arabi saw Iblis as the power that affirmed the perfection of the creators design. We should also mention that the name Beelzebuth or Bael Zebub is not necessary referring to ‘The Lord of flying things”, such as flies, but it can also refer to the Lord of Zebub, a place of unknown location, that might describe the location of the mountain Mor. It can also mean beith zebul, in conformity with what is written in the 1st Book of Kings 8: 13 meaning ‘the house upon high’ which opens up avenues of understanding Exu Mor that harmonizes with the confusion arising from dyadic opposition. From this origin Exu Mor represents a principle amazingly profound as being the Lord of the House of Confusion. This might be taken to the symbolism of Janus in his capacity of presenting multiple choices for the seeker and herein is found his mystery – and danger.